I am very fortunate that my two boys have enjoyed good health so far. When you don’t face health issues, it’s something that’s easy to take for granted. My usual complaints fall into the categories of being too busy, not getting enough sleep, and worrying about finances. But every once in a while, I’m reminded that these “problems” are nothing compared to what many families face. Harsh? You bet. But how do you think these kids and their parents feel? I can only imagine the grief, the turmoil, and the burden. I’ve seen it with aging adults, including my own grandfather, which was terrible – but for a child to be plucked from the beginning of life, without ever having the chance to blossom, and given a death sentence before life has truly begun? It’s unfair. It’s unthinkable. If you haven’t faced this within your own family, it’s likely that you know someone who has. I’ve known children who were diagnosed anywhere from one year old to their teens. I’m not sure which is worse – never being able to remember a time before becoming sick or living a seemingly normal life, only to have the rug pulled from underneath you when you thought adolescence was bad enough by itself. Either way, any time I meet one of these children or parents or siblings, I realize how strong they must be, how much different their lives are than mine, and I yearn for a way to help. For someone like me, neither a scientist who will someday find a cure nor a medical professional who can treat and care for one of these patients, I feel pretty useless. Then several years ago, I stumbled upon News 95.5 and AM 750 WSB’s Care-a-Thon. It’s an annual event that assists funding family support services and research, as well as the fellowship program at the Aflac Cancer Center. As I listened on the radio, I heard parents and their children share their amazing and heartbreaking stories – and triumphs. I knew that I couldn’t give much, but I also couldn’t not give. I knew that if everyone listening took a few minutes and gave a few dollars, millions could have been raised. In fact, last year, the WSB Care-a-Thon benefiting the Aflac Cancer and Blood Disorders Center of Children’s Healthcare of Atlanta raised over $1.5 million. 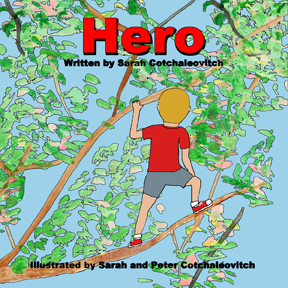 This year, I hope to make my portion even more than usual by giving the proceeds from my children’s book Hero to this worthy cause. 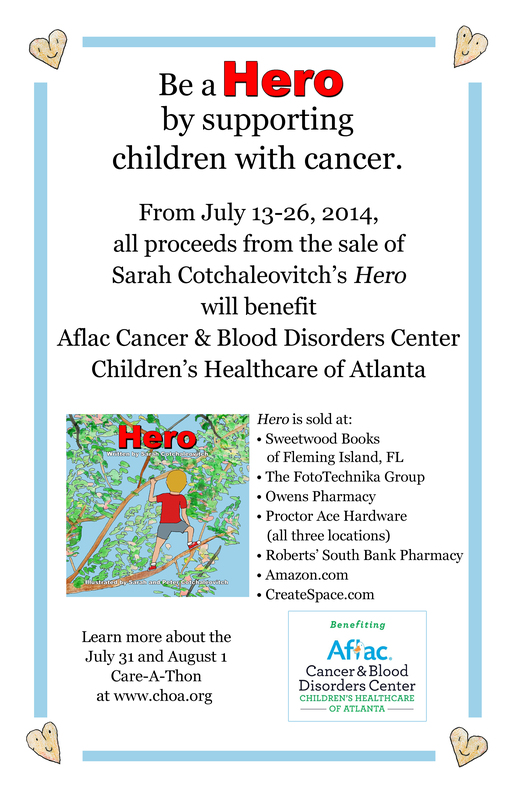 From Sunday, July 13 through Saturday, July 26, 2014, I will donate 100% of my net proceeds from every Hero sold – those purchased directly from me, from any location in Northeast Florida that carries it, and from Amazon.com. Hero is also available from Amazon.com. If you already have a copy, why not purchase another to donate to Children’s Healthcare of Atlanta? I think the kids there would love it. Or buy one for your favorite niece, nephew, godchild, or friend. The Care-a-Thon itself will air Thursday, July 31 and Friday, August 1, 2014. Click this link to read more about it (including stories about these amazing children), or use this link to donate directly to the Care-a-Thon online. Cancer will eventually affect everyone either directly or indirectly, but with our help, these children and their families won’t have to go it alone.